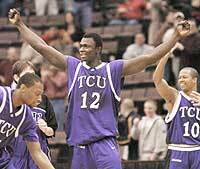 The Frogs hold off Marquette to move to the next round of the Conference USA Tournament. FORT WORTH  Theres something about the Marquette Golden Eagles that brings out the best in the Horned Frogs. Maybe its the fact the Eagles made the Final Four last season. Or maybe its that the Frogs get more jacked up for a game against a nationally prominent program. Freshman Femi Ibikunle (center), junior Aaron Curtis (left) and junior Marcus Shropshire (right) celebrate their win over Marquette in the first round of the C-USA Tournament at Cincinnatis U.S. Bank Arena Wednesday. Vision in Action, a group Chancellor Victor Boschini developed to design a three- to five-year plan for TCUs future, held its first of six town hall meetings Wednesday to seek input from faculty, staff and students. Students traveling on school-sponsored trips next fall will not be allowed to drink alcohol during the trip if a proposed policy is approved. In the past, this newspapers editorial board has criticized the Student Government Association for mishandling student funds. A group of pro-life Texans in Waco known as Pro-Life Waco has recently called for a boycott of Girl Scout cookies. At first, the idea of boycotting a product associated with wholesomeness seems ridiculous. The womens tennis team improved its record during a 10-match home stretch to 3-1 with a win over the Virginia Cavaliers.